Built on the premise of sparking civil conversation, the event at Hesston College and historically brought together voices from a variety of backgrounds and schools of thought to listen and share with one another. Lehman shared that the first Jefferson Dinner was held in 1790 when Thomas Jefferson, then secretary of state, gathered representatives of different sides of a disagreement on how the new country would pay for the Revolutionary War. To that point, the disagreement had resulted in a deadlock in Congress, and Jefferson hoped civil dialogue would bring about a compromise. And it did – The Compromise of 1790, also known as The Dinner Table Bargain. Today, Jefferson Dinners are being encouraged by the Village Square, a non-profit, non-partisan, educational organization based in Florida. Likewise, rotary clubs around the country are sponsoring dinners to facilitate dialogue. An important part of the format is being set around round tables so no one is at the head and there is no hierarchy. 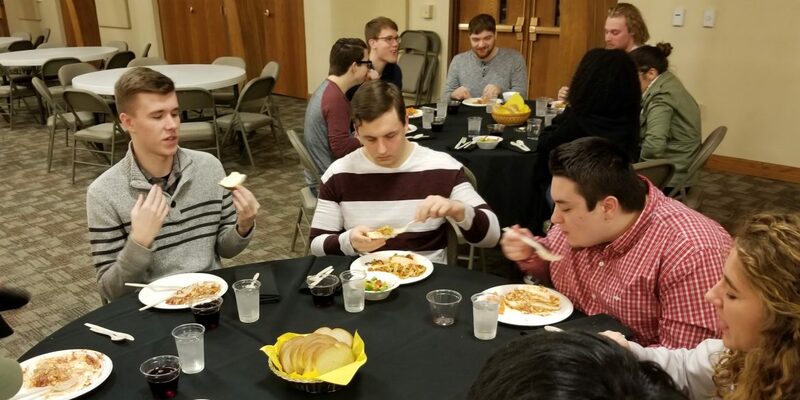 At Hesston College, the buzz of conversation and laughter permeated the air as students engaged with one another in a new way.